When Chelsea Chambers inherits The Higher Grounds Cafe after her mother’s death, she works to make a new life for herself apart from her soon-to-be-ex-husband. She struggles to fulfill her ambitions with the outdated cafe until neighbors and strangers alike offer a hand. 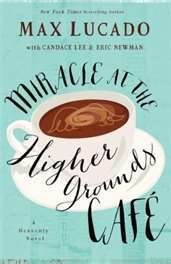 When nothing short of the miraculous steams over at the cafe, Chelsea is too busy to notice. The café hookup to God through a mysterious Internet blog brings skeptics and seekers in for a cup of coffee. For Chelsea, the miracle will be discovering the bravery to face her deepest questions and find that heaven has been there all along. Though Lucado stretches the imagination with angelic characters and the miracle of an Internet connection to heaven, the struggles of Chelsea Chambers settle the novel in reality. Issues such as divorce, single-parenting, and family restoration bring the story home to every reader. There are themes of forgiveness and restoration throughout the novel. The reader sobs and rejoices with Chelsea when sweet forgiveness restores family bonds.